NETWORK FINALS: The special 20/20 gained 0.1 in final numbers, but things got even uglier for the premiere of THE OUTPOST, which fell 0.1 to 0.1. WORLD OF DANCE lost 0.1 as well. CABLE HIGHLIGHTS: USA’s WWE SMACKDOWN led Tuesday cable, up 0.14 to 0.68, with CHRISLEY KNOWS BEST up 0.08 to 0.49, and THE CROMARTIES up 0.03 to 0.24. MTV’s THE CHALLENGE returned at 0.52. Bravo’s BELOW DECK came back from a week off at 0.49. On OWN, THE HAVES AND HAVE NOTS rose 0.09 to 0.40, and LOVE IS was up 0.07 to 0.25. 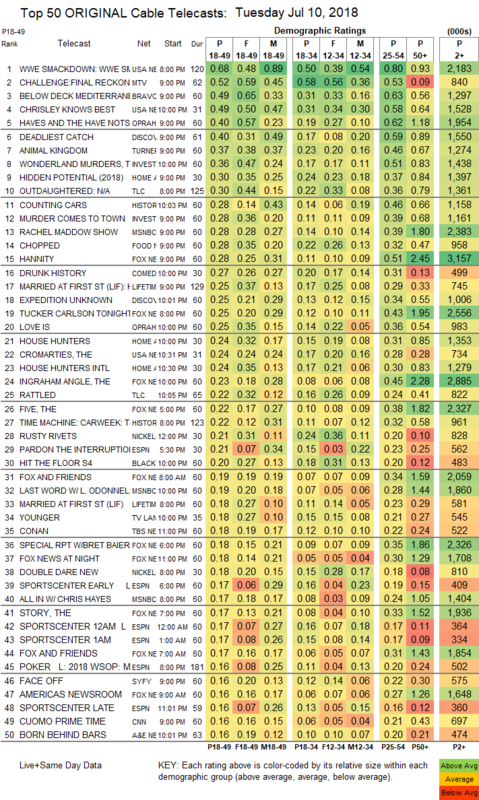 Discovery’s DEADLIEST CATCH climbed 0.07 to 0.40, and EXPEDITION UNKNOWN returned from a week off at 0.25. TNT’s ANIMAL KINGDOM was steady at 0.37. On ID, THE WONDERLAND MURDERS jumped 0.11 to 0.36, and MURDER COMES TO TOWN was up 0.08 to 0.28. On HGTV, HIDDEN POTENTIAL gained 0.06 to 0.30, HOUSE HUNTERS ticked up to 0.24, and HOUSE HUNTERS INTL was at 0.24. On TLC, OUTDAUGHTERED returned at 0.30, and RATTLED at 0.22. On History, COUNTING CARS was at 0.28. With the Supreme Court announcement out of the way, MSNBC’s RACHEL MADDOW SHOW tied for the cable news demo lead at 0.28/0.39/2.4M with Fox News’s HANNITY at 0.28/0.51/3.2M, and CNN’s CUOMO PRIME TIME was at 0.16/0.21/700K. Food Network’s CHOPPED held at 0.28. On Comedy Central, DRUNK HISTORY was steady at 0.27, and THE JIM JEFFERIES SHOW came back from holiday break at 0.15. The season premiere of Lifetime’s MARRIED AT FIRST SIGHT was at 0.25. The season premiere of BET’s HIT THE FLOOR was at 0.20. TV Land’s YOUNGER returned from its holiday break at 0.18, and TEACHERS was at 0.09. Syfy’s FACE OFF rose 0.05 to 0.16. A&E’s BORN BEHIND BARS premiered at 0.16. 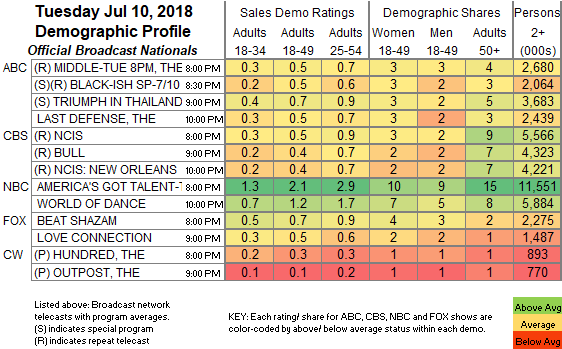 Freeform’s THE BOLD TYPE stayed at 0.15. AMC’s HUMANS was steady at 0.07.